We were now finally going to visit the Jal Mahal. Both of us were quite excited about the photo-op involved. Since we cannot visit the place – the photo-op was the next best thing to get all excited about. Don’t you agree? It had looked heavenly during the pink-city-by-night tour. Though it did not look as good during the day. The paint was peeling in some places and the discolouration was quite evident. But, the sunlight was perfect and the picture came out really well. 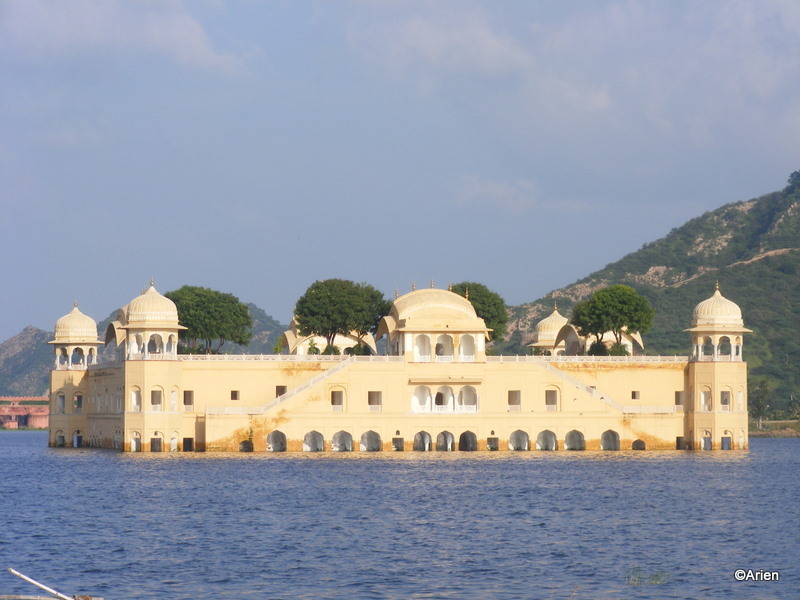 I read this year that they have finally opened the Jal Mahal to tourists and visitors – That is good news! The rickshaw-wallah wanted to leave for the day but we still had places to see and miles to go before we sleep !! 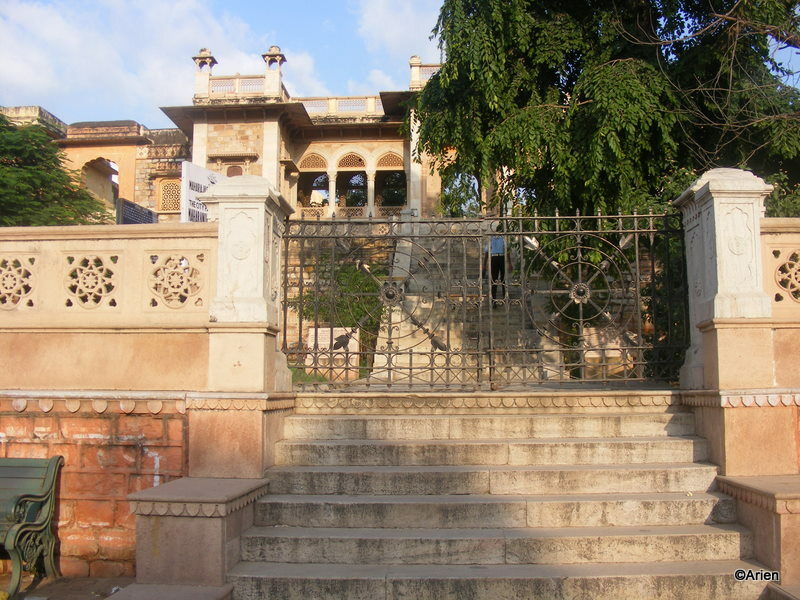 The first shock of the day was the visit to Maharani Ki Chatri – the gate was closed and a security guard shooed us away. I was quite surprised. I insisted that the Arien take a picture of the closed gate — he refused! So, I took the camera and shot this picture. At that time, I had no clue about the place. I jes felt that the guard was mean. Today, as I blog about it, I had to search far and wide (Ok — googled it ) to figure out what the tourist spot was. And far from being an umbrella that the Maharani had owned, the place was actually a monument (usually a tomb) built in honour of the royal maharanis. I always thought that was an islamic tradition – christians also bury and have tomb stones. Did not know that the Hindu maharanis also followed the same tradition. From the gate, it looks like the place has not been open in a while – maybe I am mistaken. The next place we planned to visit was Albert Hall. We had another shock. The place was closed for the day. We realized a lil late that most of the tourist attractions are only open until 4:30 pm and it was way past 5 pm now. I could now understand why the rickshaw wallah was all set to leave for the day! Grrr.. We still went and took snaps of the entrance of Albert Hall – yes, of the entrance. This part of the sight-seeing sucked big-time 😦 I felt absolutely cheated – he knew when we went to Amber Fort that we would not even be able to visit half of the tourist spots but he still managed to negotiate a hard-bargain — Felt like total goofs! 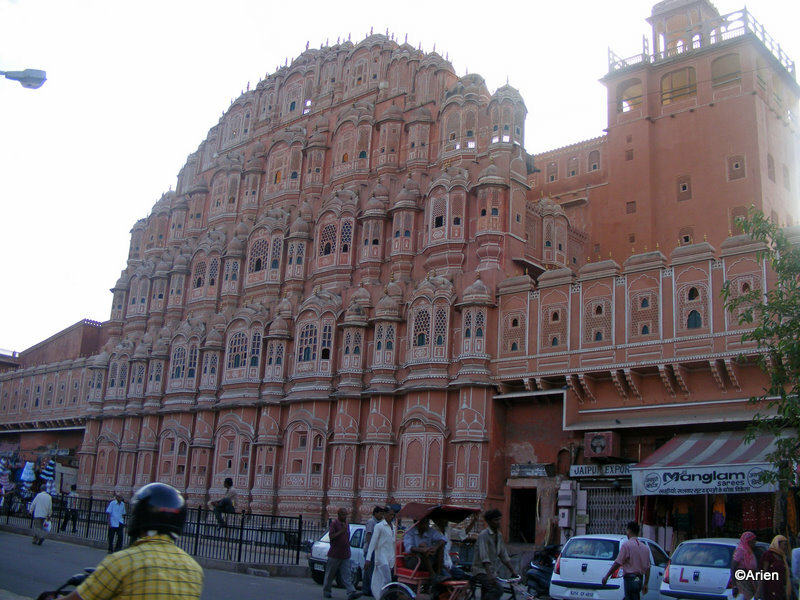 Anyway, the rickshaw fellow felt some pity for us and took us to see Hawa Mahal as well. Yet again, we took another shot from across the road and did not venture inside. I really wished we had had more time. The Arien took this opportunity to remind me of my tardiness – Grrr… what a way to end a fantastic day 😦 We returned to our hotel room and decided to take rest and have dinner at the restuarant upstairs. The dinner was great and nobody else was having dinner at that time so we had the entire resturant to ourselves – Nice! The Arien did not mention my late-start and concentrated on the food. I recieved a number of calls frm my family members! I was so happy that the day would not go waste that I was ready to leave immediately. We had to go to the Rajasthan Development Corporation. We paid 250/- per head and were escorted to a waiting Sumo which already had 3 foreigners, a driver, and a guide. We hastily introduced ourselves and were off. It was supposed to be 4 hour sight-seeing tour followed by vegetarian dinner at Nahargarh fort. 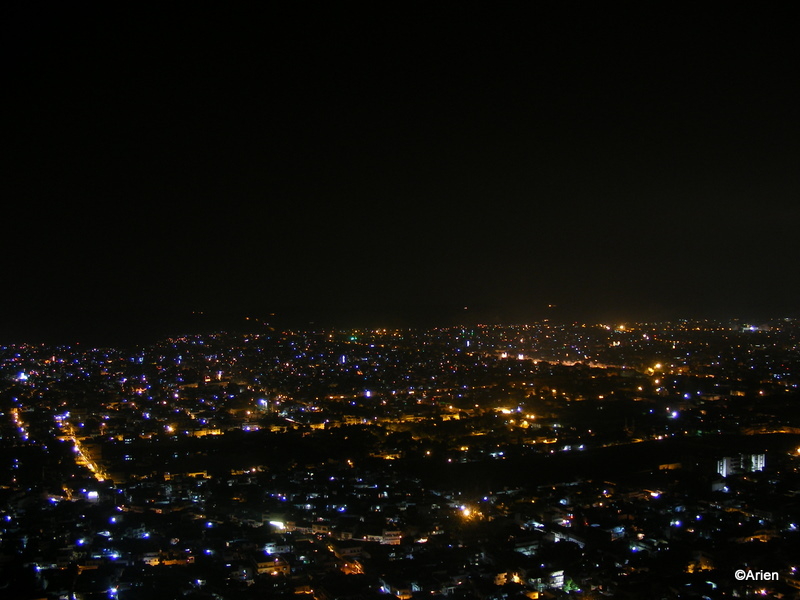 The weather was cool, reminded me of Bangalore, and we watched the various sights – all lit-up and looking gorgeous. We visited the Vidhan Sabha, Amar Jawan Jyothi which was basically paying homage to the martyrs, and Albert Hall. The Arien shot some pics of the Albert Hall but the flash bounced off the lights but we did get one decent shot. As we moved along, we talked to the foreigners mostly about general touristy things to do. We were also taken to the emporium that was maintained by the govenment. They showed you how a specific design was added to the dress material. The man who was giving us the demo used an interesting peacock design that was the mold into which colour was applied and then he added it to the material. It was quite interesting. We were also asked to purchase stuff which was supposedly available at a much-lower price. 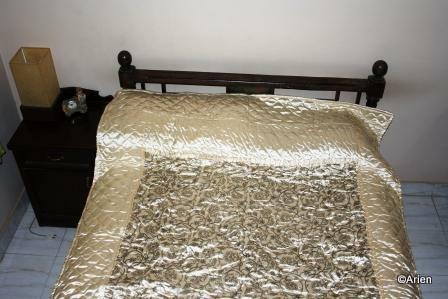 We purchased a beautiful quilt in beige colour which was all satin and looked very rich. This is a pic taken recently of the quilt at our home. One of the foreigners purchased a silk scarf which he wanted to use as a wall-decoration. Thanks to all the shopping, we were late. 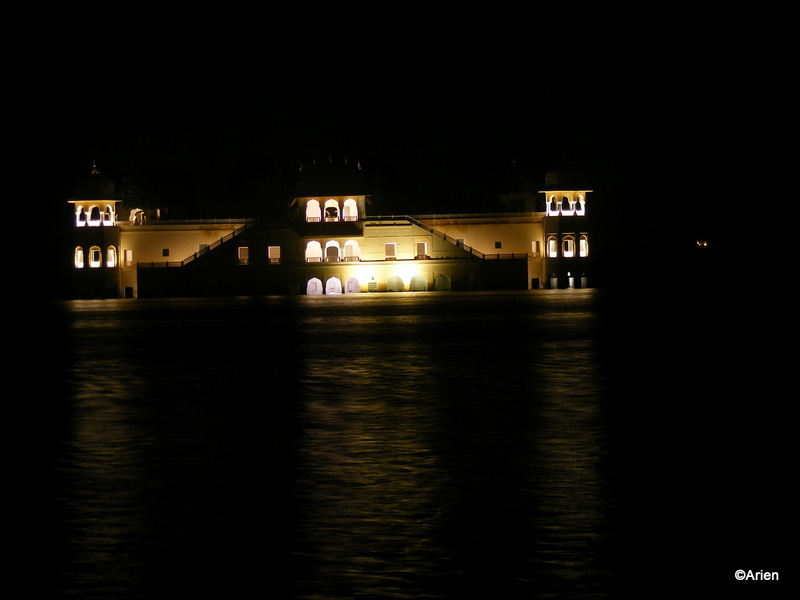 The next stop was the Jal Mahal which looked very pretty. It was not open to visitors when we visited last year around September. However, I heard that it was now open for visitors. 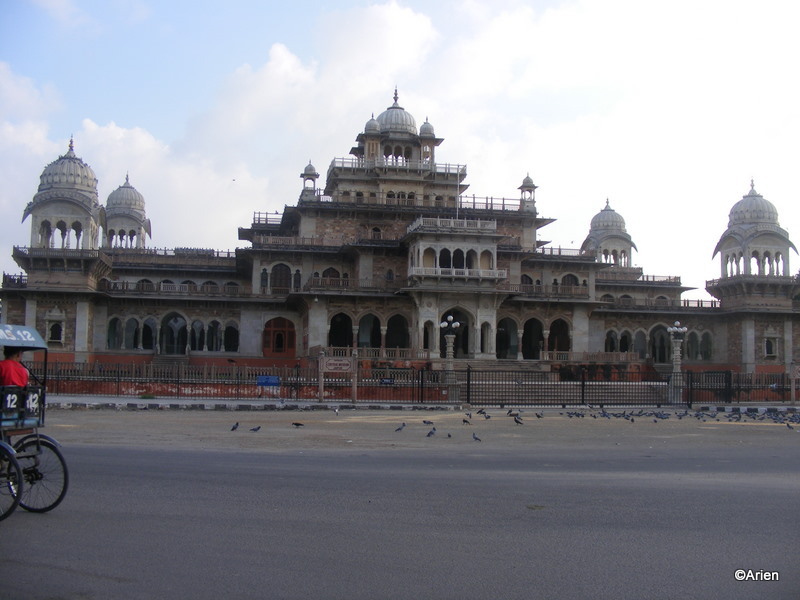 We shot some good pictures and the breeze was fantastic – it seemed a great time to visit Jaipur. The arien was busy chatting with the foreigners about their camera and other such stuff. We went to Amber fort but the lights were switched off, we were too late. By then, we had had quite a few photo-ops and so were not too disillusioned. Our last stop was the Nahargarh fort where we were supposed to have our dinner. The fort was atop a hill and everything seemed so far away, our hotel, office, it was like nothing could touch you here. They also had some rooms which they offered to toursits. We had a look, even though we were not planning to stay. The rooms seemed slightly old-fashioned and I really lowed my room at the place we were staying now. While that room would not beat staying at a Fort – I still preferred it. It was quite cold at the fort. The food served was traditional Rajasthani (I think), we could not identify some of the vegetables which was quite suprising. The foreigners did not like the food much. The Arien was shooting pics of the city from Nahargarh fort. While this pic does not do justice to the scenery, it is the best we could take of the view from one of the windows facing the city. As we returned, we were able to see Hawa Mahal without the hustle-bustle of the city and immediately, the Arien and the foreigners took snaps of the Hawa Mahal. It looks very yellow and gigantic. We hoped to see the inside of this monument before we left for Delhi. I wonder how it looks like from inside – a zillion windows to the city in general. Hmmm.. we were now yawning our face off. We all got dropped at our hotels and hastily said our byes. I was not sure if we would ever see those 3 foreigners again. 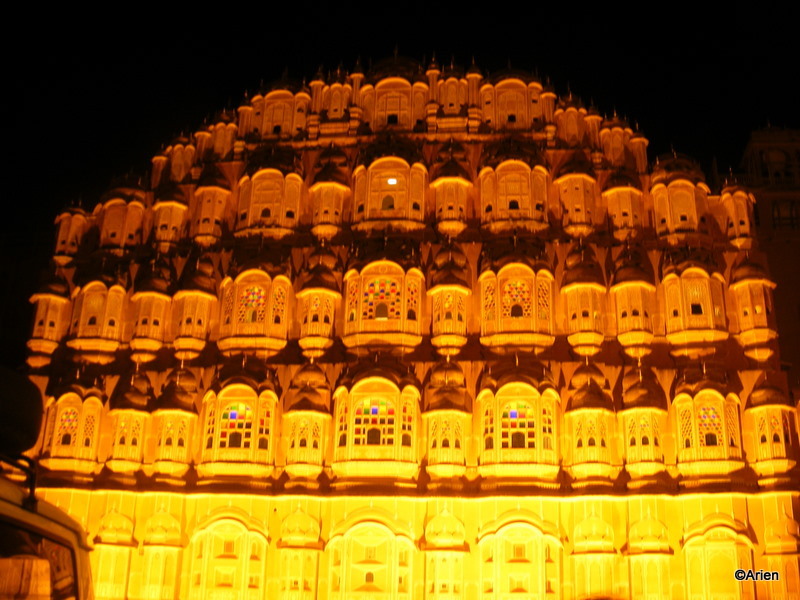 Tomorrow, we planned to visit the Amber Fort which was a major tourist attraction.